TRAMPA's Electric Mountainboard is honestly just AMAZING! Whether you take Single motor or Twin motor, (TWIN motors gives you twice as much grip (brilliant for off road) but not twice as much speed) & once your hooked up into the correct sized power source (12s Battery is perfect - you will need 2 x 12s batteries for twin motors) & tuned the VESC to your personal requirement, the performance is quite literally breath taking! 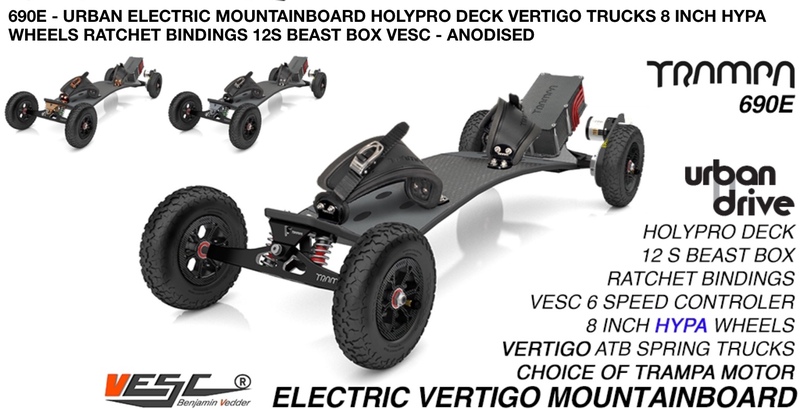 So to make the your Electric Mountainboard move, you will still need to purchase some additional items that can be found on other websites... The Minimum of components needed to complete a Single or TWIN drive board are showing below - 8-12s Battery Pack (either LiPo pouches or Li-Ion round cell packs) with High Continuous Discharge current, 12s will give you the highest performance, for example, the battry can be made from 2x 6s LiPo packs, (minimum 5800mAh each or preferably more) with 25C+ rated (The higher the C rating the better) or you can custom make your own battery along the lines of 8-12s, 2-4P (p= parralell) battery pack, spot welded from 18650 round cells, 20A+ continuous discharge per cell (eg. LG INR18650-HG2 3000mAh-20A). TRAMPA's amazingly sturdy whilst incredibly lightweight Carbon Fiber 12s MONSTER Box will easily fit 4x 6s 6200MaH 40c Zippy compact batteries which when harnessed together correctly makes TWIN 12s MONSTER!! 2x (2x6s) batteries looped together) makes TWIN 12s (you need 4x 6s Batteries total for twin 12s motor). The power is passed through XT90s Anti Spark Connectors & 50Amp Fuses (in case anything goes wrong) directly into the VESC. You will need 2 VESC for Twin Motor, 1 VESC for each motor. TWIN 12s Power is usually more power than most riders can handle but if 12s power is not enough for you the MONSTER BOX is also plenty big enough to house custom made batteries for the few out there that are crazy enough to try, you can fit up to 80x 18650 cells which is MASSIVE POWER, insane range & amazing performance!! Using cell spacers you can harness together custom made batteries packs... you can create & fit options such as 12s6P, 11s7P or 10s8P - OMG AMAZING!!! Watch this space for development in this area from TRAMPA. TWIN motor decks do not give you higher top end speed, the top speed is usually limited to the battery used & the gearing applied, but most importantly TWIN Motor decks will give you a lot more grip, especially when riding off road in loose dirt or up steep hills! 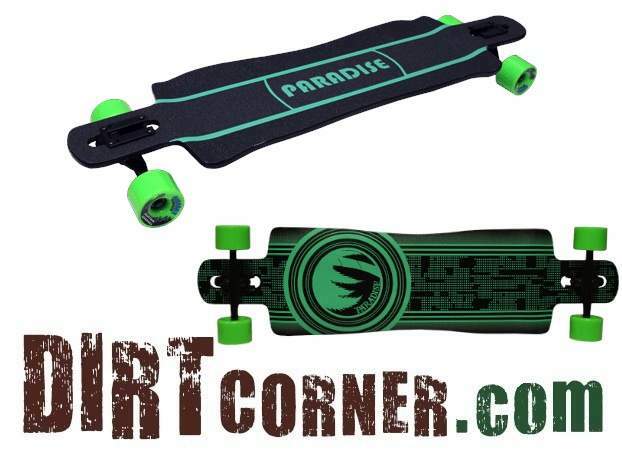 TWIN Motor Decks give you more than double the grip & you will accelerate considerably faster than single motor board. - A battery charger with built-in BMS (Battery Management System) capable of charging your battery pack configuration. Ideally capable of charging up to 12S batteries. If you split your pack into 6S blocks (or less) a cheap 6S RC LiPo charger will do the job but you will need to charge each Battery separately. - zip ties + shrink tube, hook and loop fasteners etc. Building electronic skateboards requires knowledge and skills.